Planet Urine’s UrineOut Powder™ will actually absorb and remove all the urine AND all of the other “miracle cleaning” products you’ve used. This will eliminate those odors that you or I can smell because the UrineOut Powder™. Need help choosing a cleaning system? Cleans up to 200 sq. ft. The Ultimate I Cleaning System is designed for serious spot cleaning for dog urine, cat urine, human urine stains and odors. It only Dilutes and Spreads the Dog Urine, Cat Urine or Human Urine! Any liquid based cleaning solution (including steam cleaning) doesn't work because you will never be able to "blot" or wash all of that wet liquid urine mess out of your Carpets, Rugs, Upholstery, Hardwood Floors, Tile / Grout, Linoleum, etc. You still have the dog urine, cat urine or human urine stains and smell because they are deep down in the pores of the surfaces! Liquid products cannot absorb and extract the dog urine, cat urine or human urine stains and smell and only masks the smell for a short time. Eventually the urine stains and smell return! UrineOut Powder™ is Specifically Formulated for Permanent Removal of Dog Urine, Cat Urine or Human Urine, Vomit or Feces Stains and Odors. ABSORB the source of the dogs urine, cat urine or human urine stains and odors and simply vacuum them out, FINALLY removing all of the dog urine, cat urine or human urine, vomit or feces stains, smells & odors COMPLETELY! It only Dilutes and Spreads the Dog Urine, Cat Urine, or Human Urine! Any liquid based cleaning solution doesn’t work because you will never be able to “blot” or wash all of that wet liquid mess out of the pores of your hardwood or wood floors! You still have the urine stains and smell because they are deep down in the pores of the wood surface! Liquid products cannot absorb and extract the urine stains and smell and only masks the urine odors for a short time. Eventually the urine stains and odors return! UrineOut Powder™ is Specifically Formulated for Permanent Removal of Dog Urine, Cat Urine & Human Urine, Vomit or Feces Stains and Odors from Hardwood & Wood Floors. 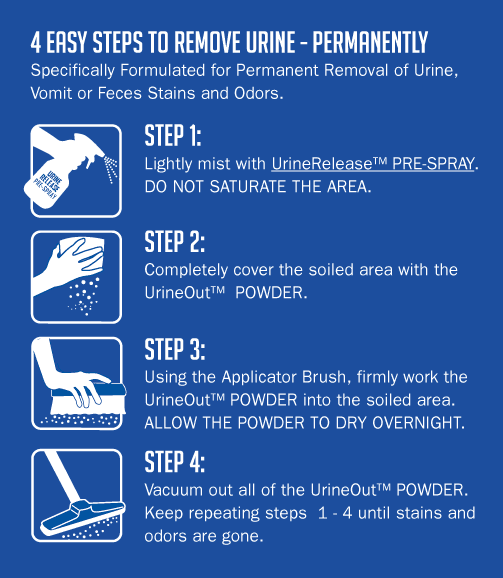 UrineOut Powder™ ABSORBS the source of the urine stains and odors and simply sweep them out Now, you can FINALLY remove ALL the dog urine, cat urine, or human urine stains, smells & odors COMPLETELY!